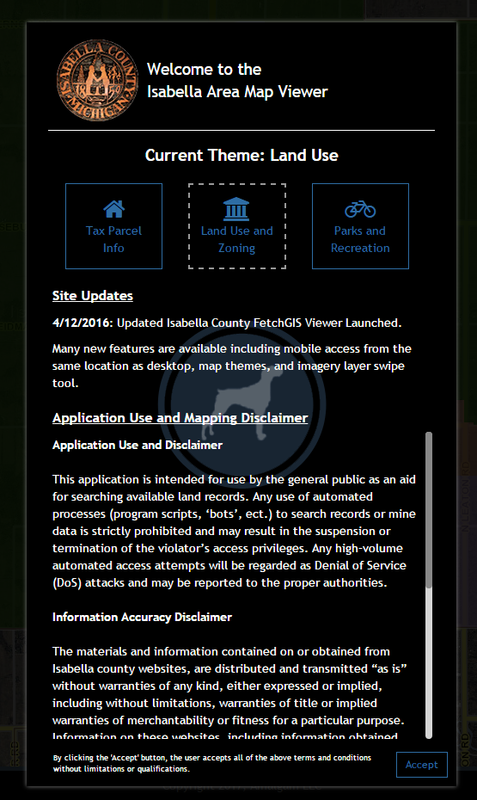 Newly created themes allow you to pick and choose between displaying tax, planning & zoning and recreation information within Isabella County. The new tools for information analysis include improved parcel and graphic buffers, enhancements to printing and emailing live maps to other users, and a layer swipe function allowing a user to analyze imagery between two different years. Previously, lower bandwidth users could access the Land Records Portal, a text formatted data search. With the enhancements made to the new interactive map viewer, including streamlined integrated mobile viewing, faster searches, and improved design, all information is now available in one efficient location. Please be sure all bookmarks are updated to the new link. Hint: You can select your preferred theme and then create a new bookmark to always open the viewer at your preferred theme! The Isabella County Community Development Department is excited to announce the release of the Isabella County Mobile Application. GIS and Land Records are once again available on your mobile device. The application provides an interactive map and land information on your phone or tablet improving access to information anytime you need it from anywhere. Users will benefit from having access to GIS and land records in the office and in the field.